Dryad Blog Hop-* Winner Drawn! Welcome to my stop on the Dryad Blog Hop! 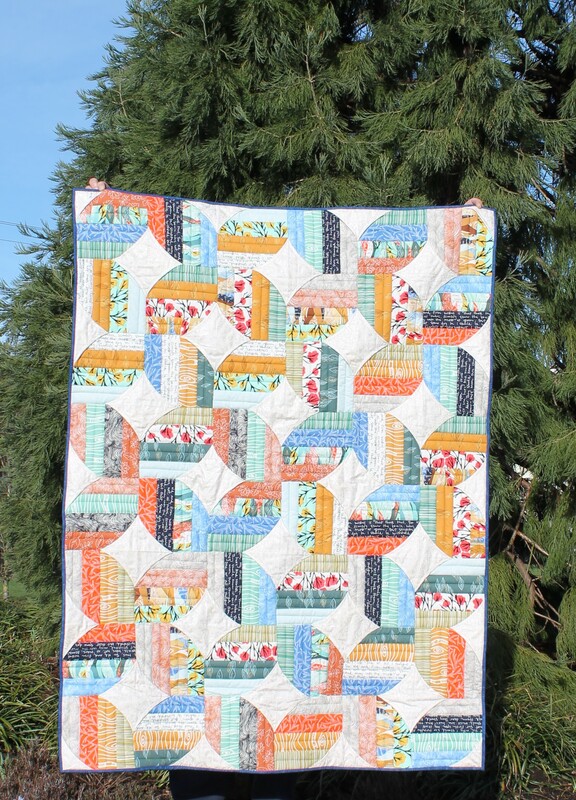 I am so excited to share a tutorial with you all for my newest quilt using Shannon’s line, Dryad! I met Shannon at Quilt Market last October, and I fell in love with Dryad. The colors are bold and vibrant and earthy, and some of the prints have some subtle metallic details. Shannon is also super awesome and so easy to chat with! When she asked me if I wanted to make a project with Dryad for her blog hop, of course I said yes! Fabri-Quilt sent me a Snack Pack, which contains 42-2 1/2″ wide strips of fabric. It also has a handy swatch chart on the back so you can preview the fabrics and know how many of each print are included in the pack. I have four favorite prints (because I couldn’t pick just one). 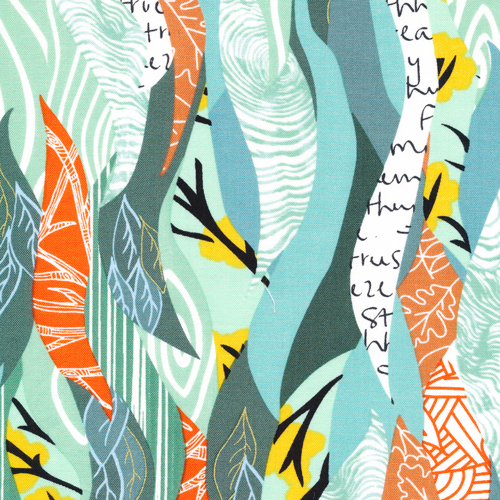 First is the main print in the cool greens, which contains bits and pieces of each prints in that colorway. The print is reminiscent of Shannon’s Scrappy Bits Applique style, which I think works really really well with the collection. It adds a lot of visual interest and pops of color to the pieces. 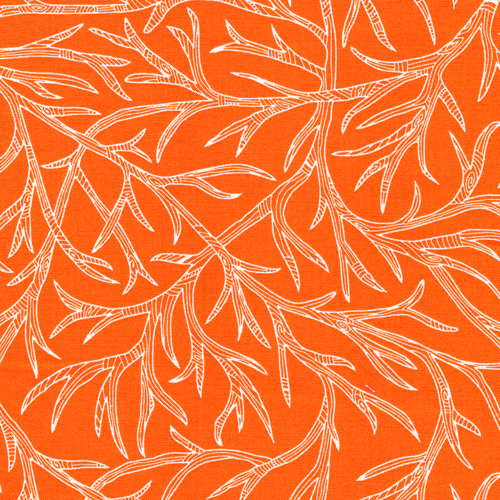 Next is the bright orange print I nicknamed branchlers, because they look like branches and antlers. The orange in person is the PERFECT hue of orange. Orange can be a hard color to pull off, and Shannon nailed it. NAILED IT. Also, kiddo loves it too! The next is the text print. 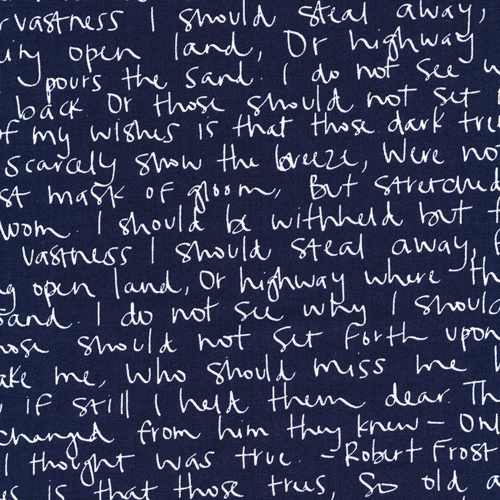 The text is a Robert Frost poem “Into My Own” written in Shannon’s own handwriting. At first glance the fabric looks black, but it’s really a rich deep indigo blue that sets off perfectly with the other fabrics in the line and would compliment a lot of what’s already in my stash. 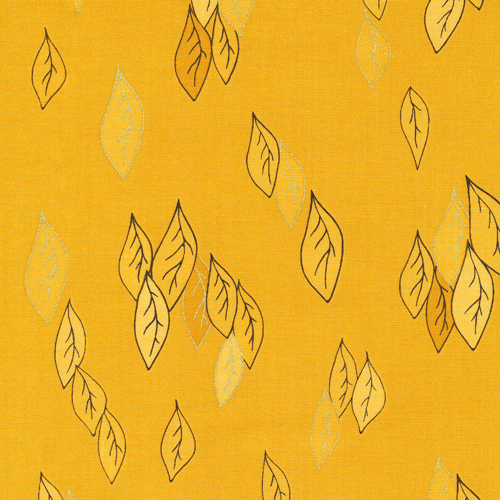 Next is the leaf print with metallic accents. I couldn’t pick between the gold and green at first, but the gold won out. It makes good almost neutral compliment to all of the other fabrics and I can see myself using it in other projects as well. Now, I am always trying to stretch my creativity when it comes to precut fabrics. I wanted to make something simple, but that so did not happen. I had a brainstorm and ran with it, and the result is a full tutorial that uses almost all of the fabrics included in the Snack Pack. 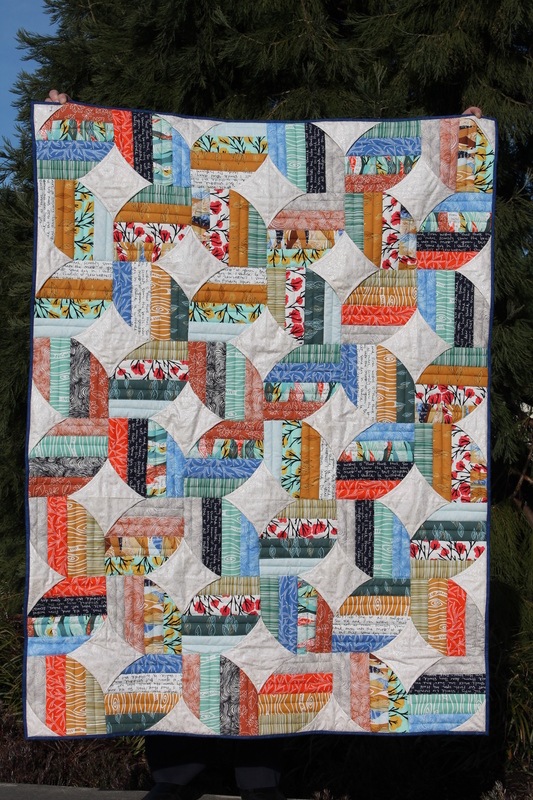 The quilt can be made by either a very patient, confident beginner, or an intermediate/advanced quilter. There are two options and you can just continue with whichever option you choose, it’s very streamlined! 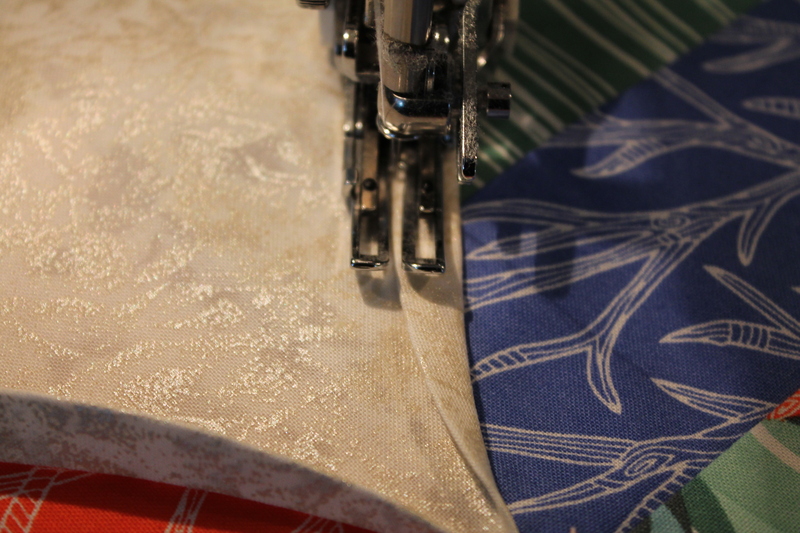 I added a metallic ivory print from my stash, and a blue binding fabric that looked like water ripples. I really wanted to have the idea of leaves, and at first I was just going to cut out leaf shapes from my strip sets. Then I started thinking more about the name, Dryad, and how they are mythical creatures that you would probably find in an enchanted forest full of sunlight and unicorns. I thought to myself “If I were in an enchanted forest, I would expect it to sparkle and shine” and the idea of the 3D curved diamonds came to life. The curve of the diamonds create the leafy shape I wanted, but with an added level of sparkle. They are the magic in the forest, the sunshine through the trees, and a perfect skill builder! I just love how Enchanted Forest turned out, and once I got going I finished in a single day. The top anyways. For quilting, I chose to double up a polycotton blend that was much too thin on its own, and then quilted it in simple straight lines that paralleled the direction of the strips. The result is a lofty warm toddler size quilt. Kiddo simple ADORES the color orange and has already confiscated this quilt. Wish me luck getting this one back to show off at Guild! Now, before the tutorial begins, here is all the information you need to follow along with the rest of the hop and enter to win some great prizes! 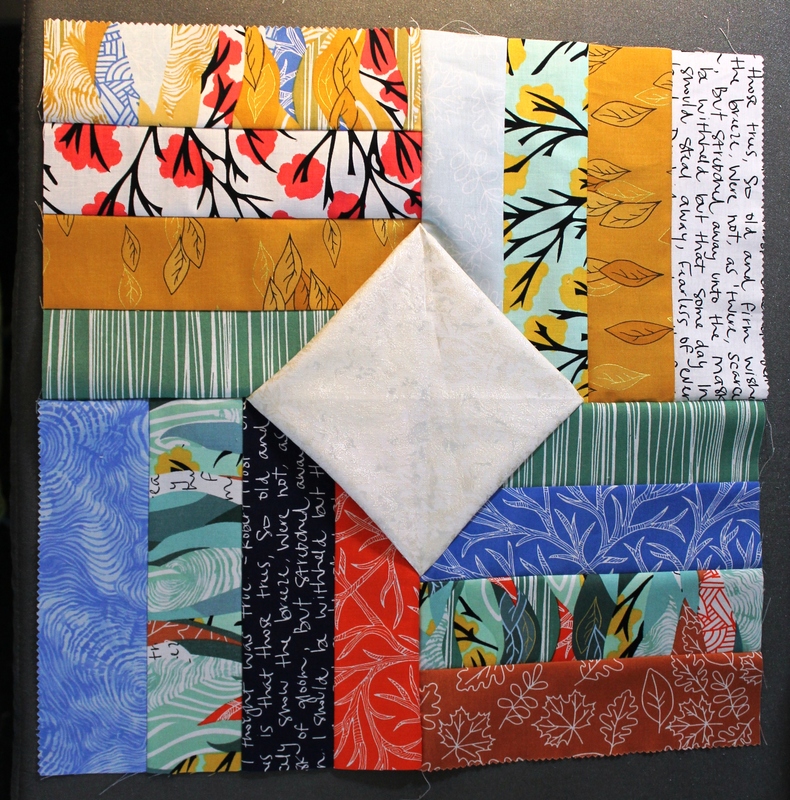 For a chance to win a bundle of Dryad, sign up to follow Fabri-Quilt’s blog, Inspired by Fabric. Then leave a comment here letting me know that you are signed up! The giveaway is open until Feb 15th at 10pm Pacific Time! 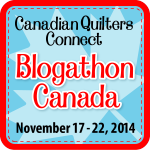 Winners will be randomly chosen after the blog hop ends. You can enter to win from each blog too! Isn’t that awesome! Make sure to go check them out, there are a ton of great tutorials and projects to be had. Also, Angela Walters is offering 10% off of Dryad fabrics from her shop, Quilting is My Therapy, during the hop using the promo code DRYAD. Fabri-Quilt just launched an Instagram account, so be sure to share your own Dryad posts with them! C&T is giving one lucky hopper a copy of Shannon’s book, Scrappy Bits Appliqué, and Aurifil will also be promoting Shannon’s coordinating thread line. So much great stuff happening! 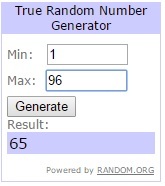 And the winner is Comment #65! Note: To see a photo or illustration larger or in more detail, click on the image and it will open that image full screen. 1. Remove and discard (2) strips from the Dryad Snack pack. Take the remaining (40) strips and randomly sew them together into pairs. Press the seams to one side, and then sew the pairs together to make (10) strip sets 8 1/2″ wide. Press in the same direction. 2. 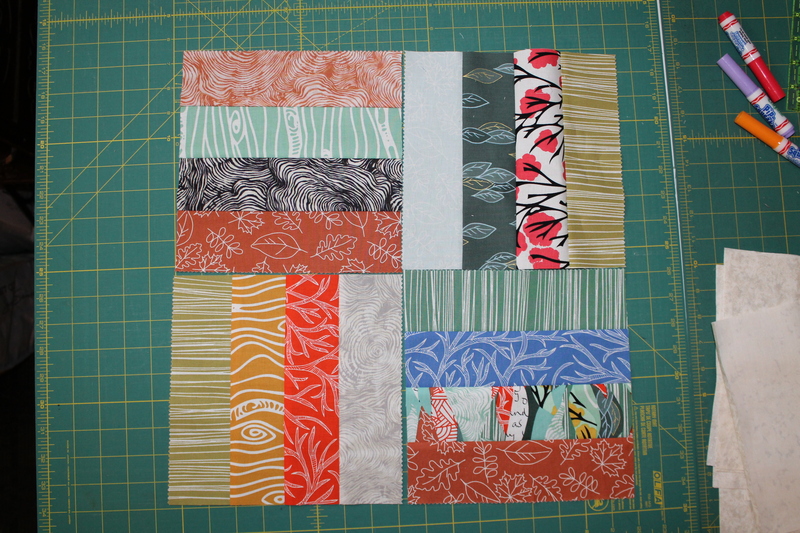 Cut the strip sets into (48) 8 1/2″ squares. You will be able to get (5) squares from a strip set. 3. Lay out the 8 1/2″ pieced squares into sets of (4), rotating the squares as shown so that the strips travel in two different directions. These pieced squares will be sewn together to make a large block with the 3-D shape in the center. 4. Take an 8 1/2″ ivory square and fold it in half wrong sides together (WST). Pin it to the right side of the first pieced square as shown, so that the raw edges match in the corner of the pieces square, and the fold is to the inside of the block. Place the second pieces square right sides together (RST) on top. Sew the pieces together down the side with the fold. Do not press yet. 5. Fold the block out of the way along the seam, so that the folded ivory piece is free. Pin and sew the other side of the folded ivory piece to a second set of pieced squares, in the same manner as before, making sure that the pieced squares are oriented as shown. Do not press yet. 6. 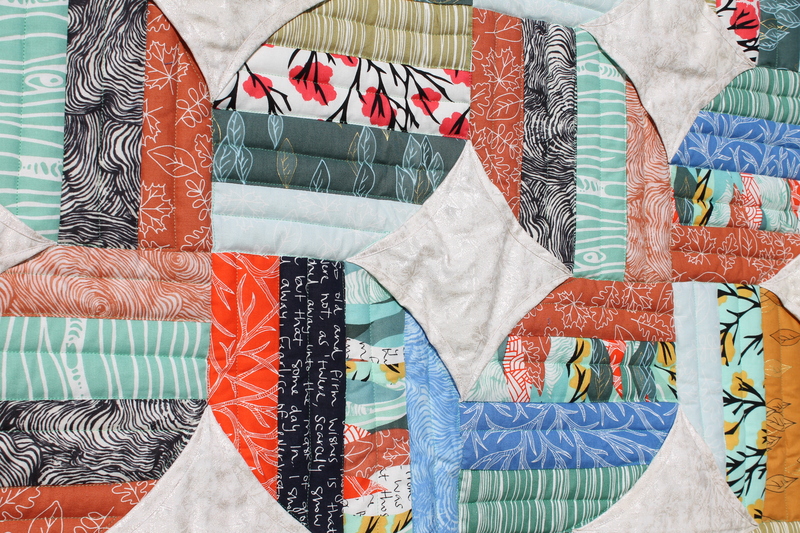 Open the block and lay it flat, to check that the strips of the pieced squares are oriented correctly. 8. From the wrong side, gently open the seam allowance of the first two seams at the center of the block, so that the seams all spin in the same direction. Press the block flat. 9. Repeat steps 4- 8 with the remaining 8 1/2″ pieced squares, to make (12) diamond blocks total. Trim and square the blocks to 16 1/2″. 10. Take one of the 16 1/2″ diamond blocks and place it right side up on your ironing board. Gently fold one the side of the diamond in towards the center, until the side form a concave curve, usually about 1/4″-3/8″ fold will achieve this. Press the side to set the curve. Repeat for the remaining sides and the remaining diamond blocks. 11. Using a matching thread for each block, topstitch right next to the fold as shown, on the inside of the diamond, backstitching at the start and stop of the seam. Trim the threads or pull them to the back of the block to hide them. This section is for the beginner quilt. After completing Beginner step 10, scroll down to “Finishing the Quilt”. Skip this section if you wish to complete the Advanced quilt. 10. 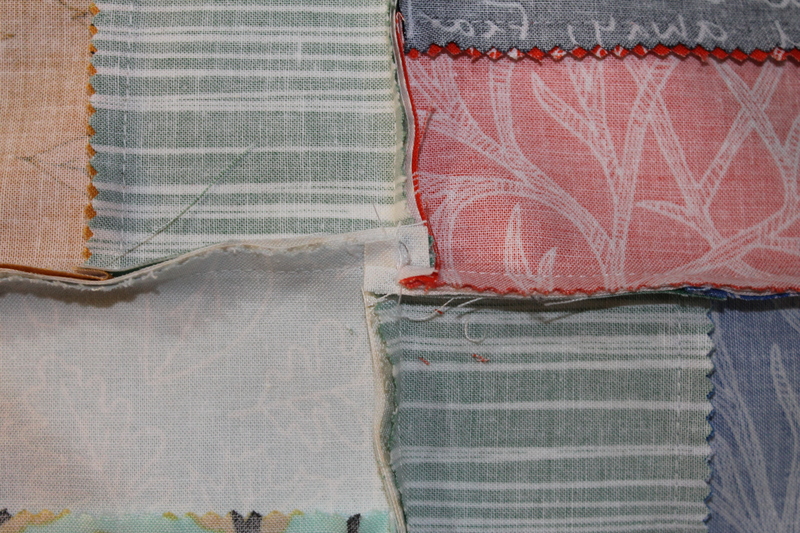 Sew the finished blocks together into (4) rows with (3) blocks in each row, matching the seam allowances. Press the even rows left and the odd rows right. Alrighty folks, this is where the steps get a bit strange, but stay with me! You can already make the 3D Diamonds, so adding them into the rows just takes a little patience and longer seams. The corner curves are super easy, and the 3D geese are simple as well. Also, lots of pictures! 10. Take one of the 4 1/2″ ivory squares and fold it in WST. Pin it to the right side in the corner of a diamond block and then baste in in place. Turn the fold back like you did for the diamonds, and topstitch in place. 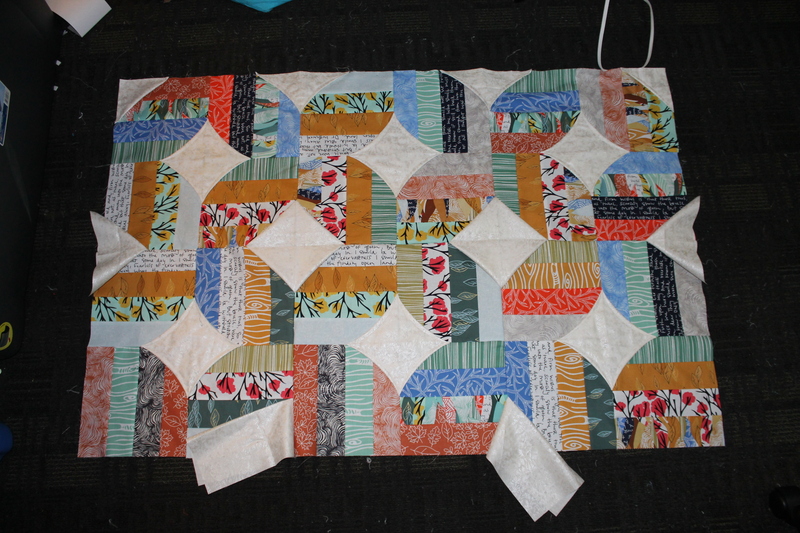 Repeat for the remaining 4 1/2″ ivory squares and three more diamond blocks. This makes (4) corner blocks. 11. Take one of the 4 1/2″x 8 1/2″ ivory rectangles and fold it in half lengthwise WST. Pin it as shown on the right side of a corner block. Take an 8 1/2″ ivory square and fold it WST. Pin it in place as shown in the opposite corner of the same corner block. 12. Place a regular diamond block RST on top of the corner block and sew them together down the side with the folded rectangles. Press the seam allowance right and open the blocks flat. 13. Place a folded ivory rectangle and square on the regular diamond block the same as you did for the corner block, and pin them in place. Place a corner block RST on top, so that the curved square of the corner block is aligned as shown. Sew down the side. Open and press the seam allowance to the right. This is the top row. 14. Take (2) regular diamond blocks and pin a folded ivory rectangles in the top corner of each as shown. These will be the side blocks of the next row. So far so good! This is where we will construct the 3D blocks that are between the rows. The technique is exactly the same as creating the regular diamond blocks, there is just some prep that needs to be done for each before sewing to set up the next set of 3D pieces in the rows below. The pieces tend to get a bit bulky as each diamond block is added and the rows are constructed, so take your time and use pins. 15. 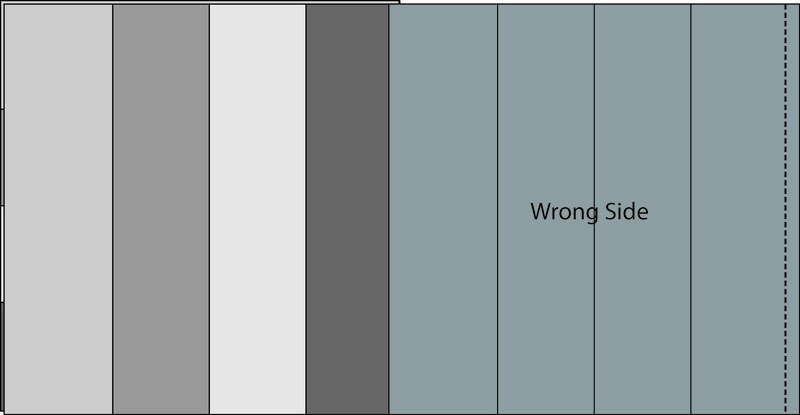 Take the left side block and place a folded ivory square in the bottom corner as shown. Using a pin or a removable marking pen, mark the opposite corner with the X. This is the corner that will be lined up with the other side of the first folded ivory square in the first row. 16. Take the first row and fold it back along the first seam allowance, like you did when constructing the diamond blocks. This will free up the folded ivory square and make it easier to sew the second set of blocks to it. 17. Match the raw edges of the left side block with the raw edges of the first folded ivory square in the first row. Pin, and then place a regular diamond block, now referred to as the center block, on the other side of the folded ivory square, RST with the side block. Sew down the side with the folded ivory square, as you did when constructing the diamond blocks. Open and press the seam allowance to the right. 18. Take the right side block and and place a folded ivory square in the bottom corner as shown. Using a pin or a removable marking pen, mark the opposite corner with the X. This is the corner that will be lined up with the other side of the second folded ivory square in the first row. 19. Match the raw edges of the right side block with the raw edges of the second folded ivory square in the first row. Pin, and then line up the center block on top of the other side of the folded ivory square, RST with the side block. 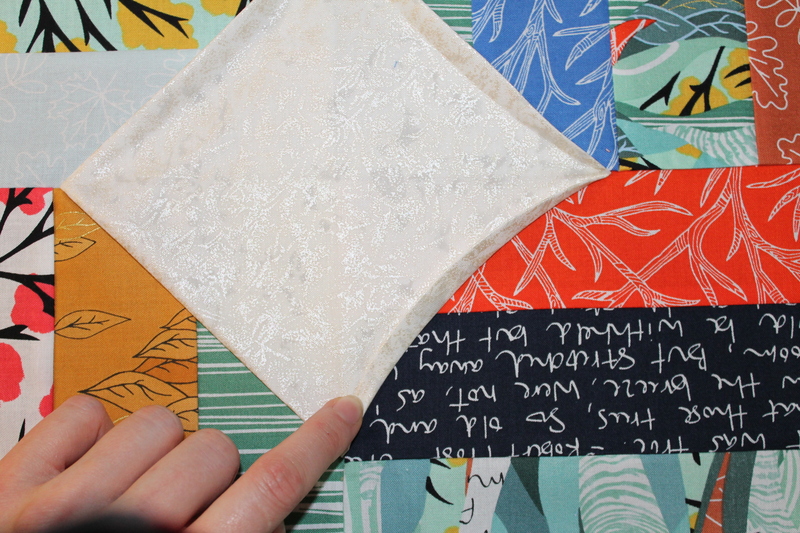 Sew down the side with the folded ivory square. Open and press the seam allowance to the right. 21. Prep a second set of side blocks. Sew the blocks of the third row EXACTLY the same as you did for the second row. 23. Take the last two corner blocks and pin the final folded ivory rectangles to them as shown. 24. Using the prepped corner blocks and the remaining diamond block, sew the last row the same as the second and third rows. Press the top well, then baste the open raw edges down to the edges of the quilt top. Fold and press all of the newly formed 3D diamond and geese shapes. Topstitch them down the exact same way you did with the original diamond blocks. Did you make it through? Then give yourselves a pat on the pack and a chocolate bar, you earned it! It’s smooth sailing from this point! 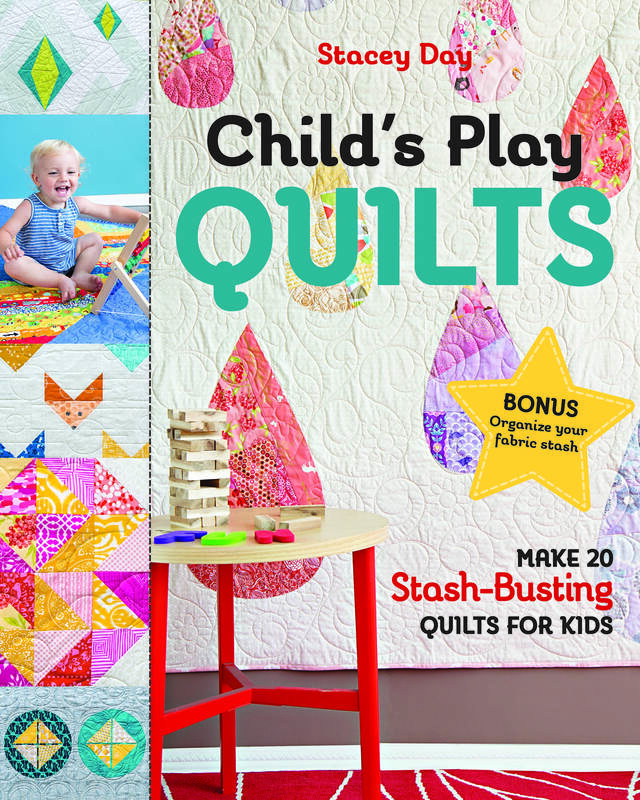 Give your quilt top a final press. Piece together the backing so that it measures about 56″x 72″ (you can make it smaller, but since I work on a longarm I like to have the extra wiggle room just in case) and then layer and baste the top, batting and backing. Quilt as desired! I used parallel straight lines and left the centers black, but there is a ton of potential for custom quilting in the strips and in the 3D shapes as well. Piece together the binding strips using a diagonal seam, and then attach the binding to the quilt. Sew on a label, take lots of pretty pictures, and enjoy! Phew! We made it through! I hope you enjoyed my stop on the hop, and if you have any questions when making your own Enchanted Forest quilt, email me or pop a question in the comments and I will help out as best I can. When you’re done, tag me on Instagram @staceyinstitches or email me a picture of the finished quilt, I love to see what you make!